if you could design it to suit your lifestyle? In association with Fisher & Paykel. Though it should never be at the expense of form, every parent knows functionality is king when there are kids in the mix. Make your life easier by including a long benchtop with plenty of room for sorting and stacking. Open shelving puts chic essentials on display, while a ladder and a few well-placed hooks are ideal for hanging. 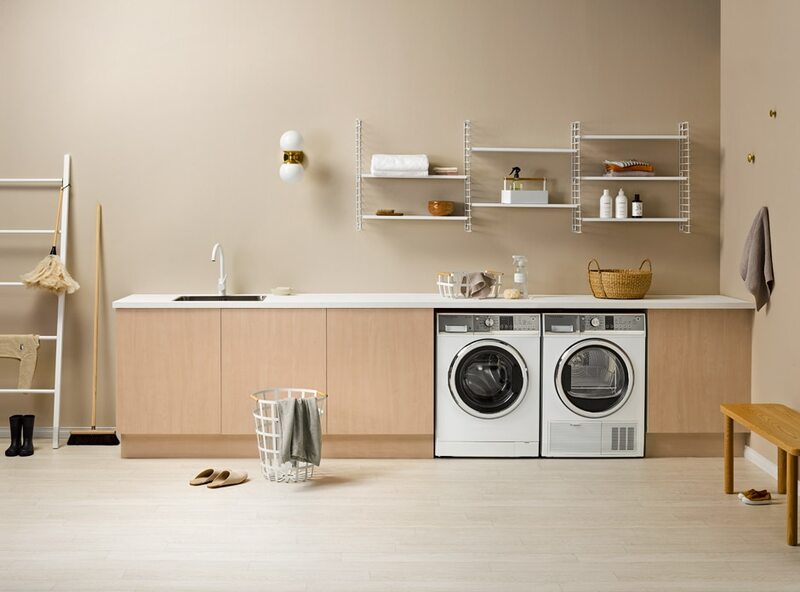 When it comes to appliances, Fisher & Paykel’s large-capacity FabricSmart™ Front Loader washing machine is fantastic for families, with wool and allergy functions, and the option to add and remove garments when it’s going. Meanwhile, the Condenser Heat Pump dryer has a key-lock mode, so little fingers can’t mess with the settings. APPLIANCES & BACKDROP Fisher & Paykel 8.5kg FabricSmart Front Loader washing machine, $2099; Fisher & Paykel 8kg Condenser Heat Pump dryer, $3199, fisherpaykel.com. Walls in Resene Half Joss; benchtop in Resene Alabaster, resene.co.nz. Renaissance vinyl flooring in Bruxelles White, $58/m2, flooringxtra.co.nz. FROM TOP LEFT Ladder, $249; duster, $95, fatherrabbit.com. Billy jumper, $60, naturebaby.co.nz. Igor gumboots, $52, lumaluma.co.nz. Broom, $99, fatherrabbit.com. M-Line 1th gooseneck mixer by Bagnodesign, $899, thekitchenhub.co.nz. Bacino 542 undermount sink, $689, aquatica.co.nz. Soap dish by Redecker, $29; soap, $13, fatherrabbit.com. House slides, $229; Marlow tee, $229, juliettehogan.com. Tosca laundry basket, $119, paperplanestore.com. Tosca storage basket (on bench), $65; face towel by Mavis & Osborn, $22, paperplanestore.com. Sisal Round body brush, $19; linen water, $55; Bowl basket, $79, fatherrabbit.com. Sunday bench, $395, sundayhomestore.co.nz. Victoria shoes, $55, lumaluma.co.nz. ON WALLS, FROM LEFT Compact 02 wall light, $620, douglasandbec.com. Tomado shelving system, from $185, goodform.co.nz. Towels, $35 each, fatherrabbit.com. Cotton cloths, $26/set of 3, paperplanestore.com. Body brush, $59, everyday-needs.com. Tosca toolbox, $59; Bondi Wash bench spray, $30; Yoshii hand towel (striped), $38; hand towels by Mavis & Osborn, $28 each, paperplanestore.com. Wool and cashmere wash, $35; hand wash, $39; body soap, $59, fatherrabbit.com. 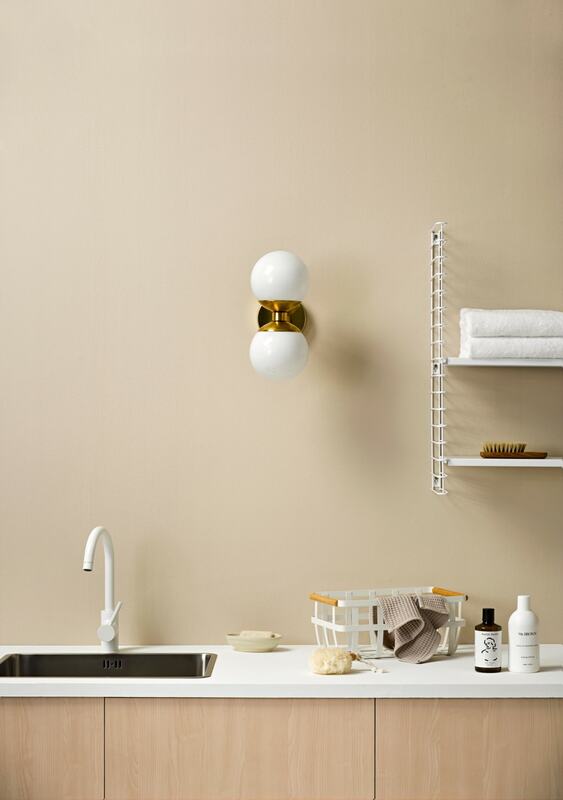 The Dots hooks by Muuto, from $29 each, bauhaus.co.nz. Hand towel by Mavis & Osborn, $28, paperplanestore.com. Wooden bowl stylist’s own. Cabinetry custom-made by homestyle. Got more style than space? Maximise the latter by moving your Fisher & Paykel appliances up in the world with their handy stacking kit – it’s perfect for apartment living. Tuck it all away behind dark timber cabinetry with luxe brass accents. 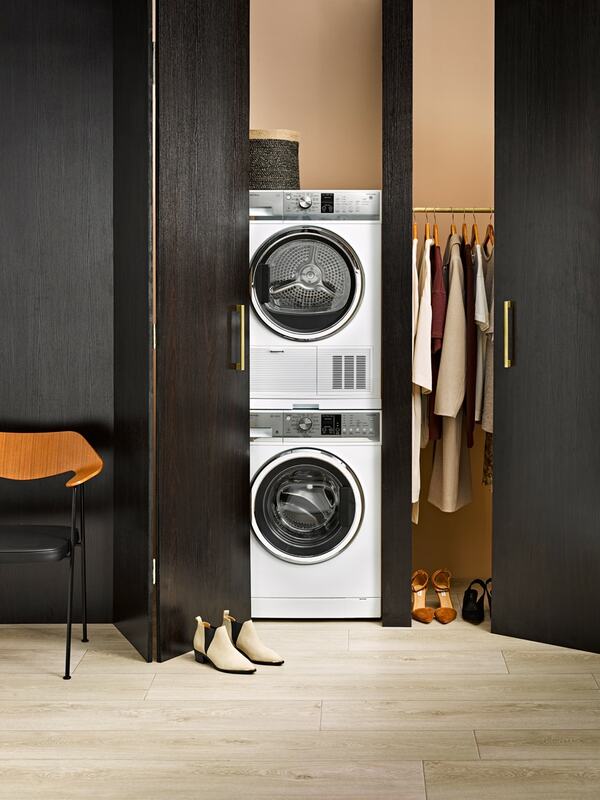 As for those designer threads, Fisher & Paykel’s FabricSmart™ Front Loader washing machine provides the ultimate fabric care and is super-quiet too. 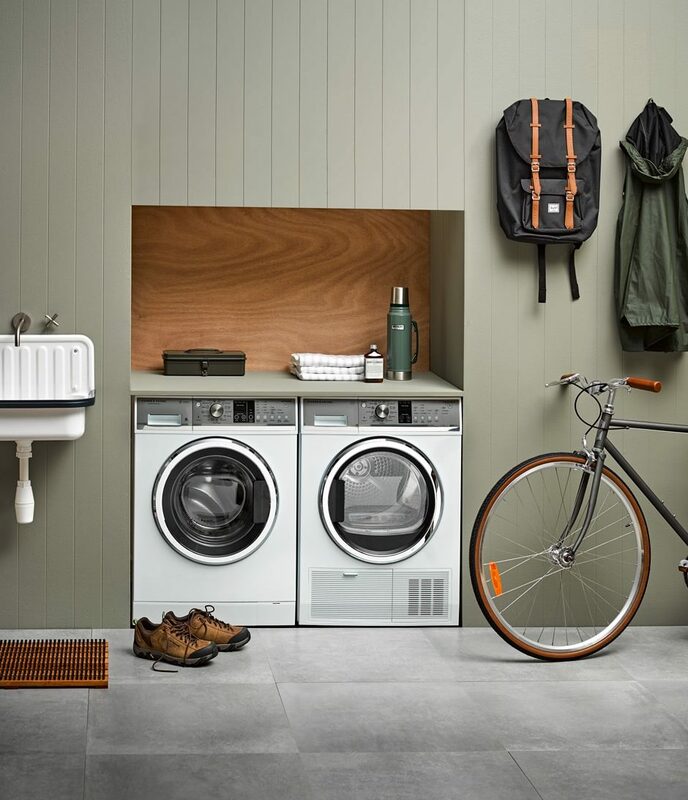 Choose its delicate, wool or wrinkle-free cycles for your high-end favourites, then finish the job with the Condenser Heat Pump dryer set to wrinkle-free. This dryer couldn’t be easier to install: it doesn’t need venting, so just plug it in and press go. APPLIANCES & BACKDROP Fisher & Paykel 8.5kg FabricSmart Front Loader washing machine, $2099; Fisher & Paykel 8kg Condenser Heat Pump dryer, $3199; Fisher & Paykel stacking kit, $145, fisherpaykel.com. Interior cabinet wall in Resene Cashmere, resene.co.nz. 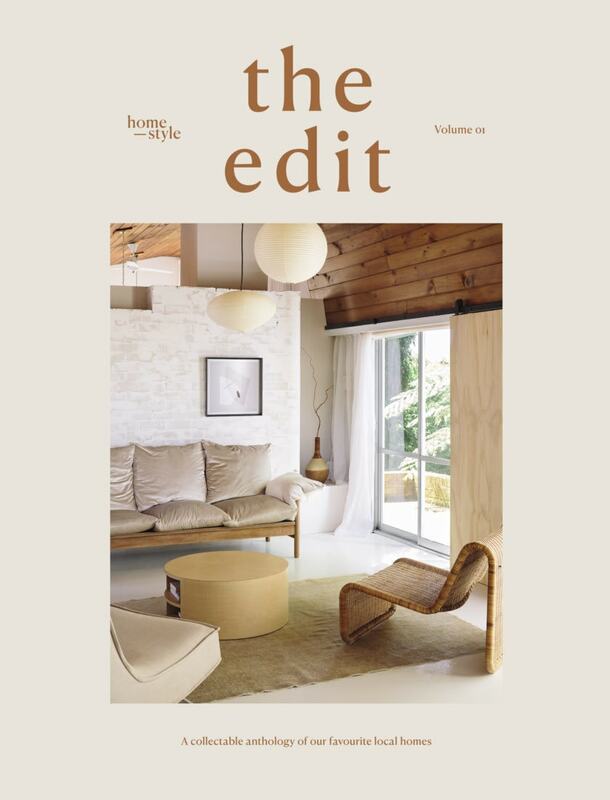 Studio Prestige vinyl flooring in Prestige Oak Light Beige, $35/m2, flooringxtra.co.nz. 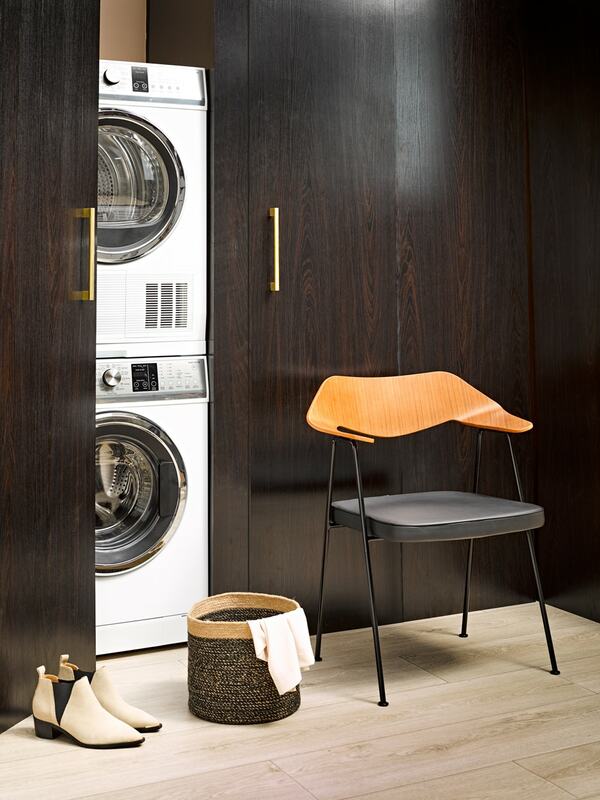 LAUNDRY SCENE, FROM LEFT 675 chair by Case, $830, simonjamesdesign.com. Baby ankle boots, $350, latribe.co.nz. Basket (on washing machine), $43, tradeaid.org.nz. Clothing juliettehogan.com. Penny Point heels, $290; Kitty slingbacks, $290, latribe.co.nz. Hardware and cabinetry custom-made by homestyle. and pale khaki creates an earthy vibe. Make light work of all that dirt with the Fisher & Paykel FabricSmart™ Front Loader washing machine’s heavy-duty and sports function – or turn it to soak for stains. Next door, the Condenser Heat Pump dryer has a seven-star energy rating and a special drying rack for shoes and hats. APPLIANCES & BACKDROP Fisher & Paykel 8.5kg FabricSmart Front Loader washing machine, $2099; Fisher & Paykel 8kg Condenser Heat Pump dryer, $3199, fisherpaykel.com. Walls in Resene Cobblestone, resene.co.nz. 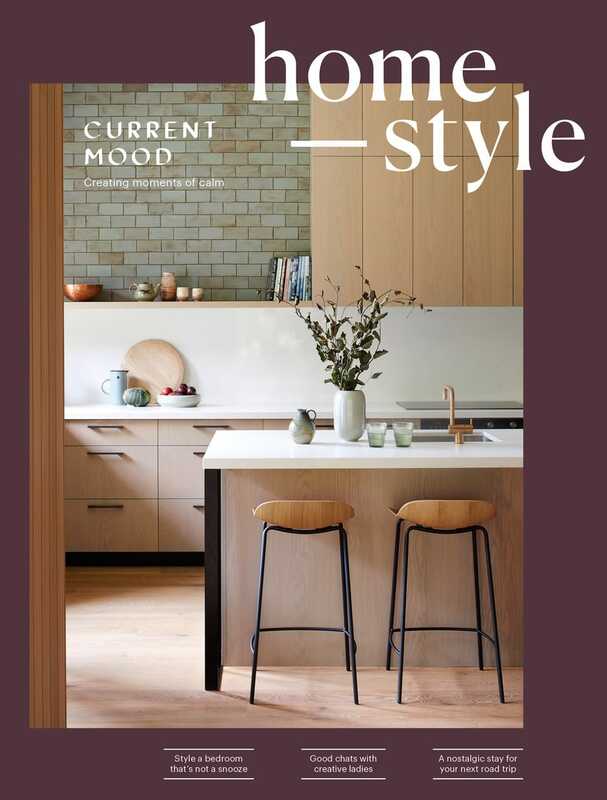 Nord Cement Matt 60 tiles, $75/m2, tilespace.co.nz. 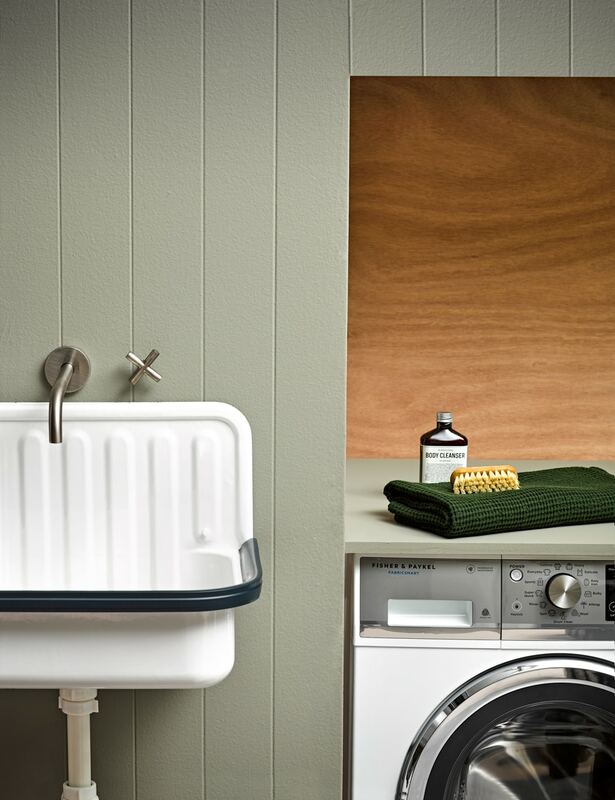 LAUNDRY SCENE, FROM TOP LEFT Chap wall-mount mixer, $849, plumbline.co.nz. Bucket sink by Alape, $570, metrix.co.nz. Doormat, $130, everyday-needs.com. Strowan men’s NGX hiking shoes, $160, kathmandu.co.nz. Toolbox, $69; Japanese bath towels, $47 each; body cleanser, $39; thermos, $75, everyday-needs.com. Little America bag by Herschel Supply Co, $199, area51store.co.nz. Jacket by Rains, $160, fatherrabbit.com. Downtown bike by Reid, $429, evolutioncycles.co.nz. ABOVE Nail brush, $26, everyday-needs.com. Towel by Mavis & Osborn, $28, paperplanestore.com. Cabinetry custom-made by homestyle.